Butter the sides of a heavy saucepan. Place the sugar, salt, corn syrup, milk, and butter in saucepan and set over medium heat. Cook, stirring constantly with a wooden spoon, until sugars have dissolved and mixture comes to a boil. Continue to cook to a soft ball stage, approximately 236 degrees F on candy thermometer, stirring very often (watch your heat. If it gets to hot, the candy could boil over. 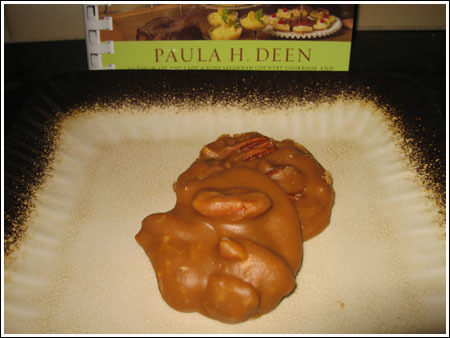 Remove from heat and allow candy to cool for 10 minutes in pan. (Note: I had to let it rest for at least 20. At 10 minutes, it was still to droopy to add the vanilla and pecans.